I asked to look at the request, which ran a simple listing of all invoices entered at a scheduled time each day. I opened up the schedule screen and there was a tick box to “Increment date on each run.” This was not ticked, and they were running the report from day 1, every day. When they accepted the system at go live there was no issue. I think all system implementations should include a 3- or 6-month review. Regardless of how good the implementers are, their setup is based on the information known at the time. In production, that information (volumes, etc.) often changes, and when it does, it can affect your decisions. My friends Connie Smith and Lloyd Williams call this performance antipattern The Ramp. With the ramp, processing duration increases as the system is used. This invoicing system exhibited ramp behavior, because every invoicing process execution would take just a little bit longer and print just a few more pages than the prior execution did. The problem of the ramp reminds me of a joke I heard when I was young. A boy, one who is athletically very talented but not too bright, takes on a job as a stripe painter for the highway department. The department gives him bucket of paint and a brush and drives him out to the highway he’s supposed to paint. His first day on the job, he paints a stripe almost seven miles long. This is an utterly stunning feat, for no one previously had ever painted more than five miles in a day. The department was ecstatic. Apparently, this boy’s true calling was to paint roadways. The excitement abated a little bit on the second day, when the boy painted only five miles of highway. But still, five miles is the best that anyone had ever done before him. But on the third day, the distance dropped to two miles, and on the fourth day, it fell to less than one mile. The department managers were gravely concerned, especially after having been so excited on the first couple of days. So they had a driver go out to fetch the boy, to bring him back to the office to explain why his productivity had been so outstanding at first but had then declined so horribly. The reason was easy to understand, the boy explained. Every day he painted, he kept getting farther and farther away from where he had set his paint bucket on the first day. I’ve known people who’ve written linked list insertion algorithms this way. Joel Spolsky has written about string library functions in C that work this way. I’ve seen people write joins in SQL that work this way. And Debra’s publishing company ran their invoices this way. 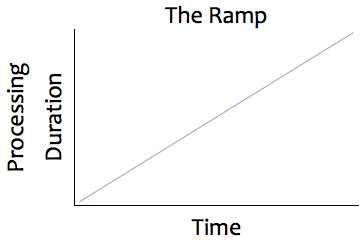 When you have the ramp problem, individual response times increase linearly. …Which is bad. But overall response time—through the history of using such an application—varies in proportion to the square of the number of items being processed. …Which is super-duper bad. Imagine, in the invoicing problem that Debra solved, that the system had been processing just one invoice per day and that each invoice is only one page long. Given that she was at a “very large publishing company,” it’s certain that the volume was greater than this, but for the sake of simplifying my argument, let’s assume that there was just one new invoice each day. Then, with the “Increment date on each run” box left unchecked, there would be one invoice to print on day 1, two on day 2, etc. On any day n, there would be n invoices to print. Obviously, the response time on any given day n would thus be n times longer than it needed to be. At the end of the first year of operation with the new application, an invoice would take 365 times longer to print than on the first day of the year. But the pain each day of invoice generation is not all there is to the problem. The original concern was expressed in terms of all the paper that was wasted. That paper waste is important, not just because of the environmental impact of unnecessary paper consumption, but also because of all the computing power expended over the operational history of the application required to generate those pages. That includes the resources (the electrical power, the CPU cycles, the memory, the disk and network I/Os, etc.) that could have been put to better use doing something else. In the grossly over-simplified invoicing system I’ve asked you to imagine (which creates only one invoice per day), the total number of pages printed as of the end of day n is 1 + 2 + … + n, which is n(n + 1)/2. All but n of those pages are unnecessary. Thus the total number of wasted pages that will have been printed by the end of day n is n(n + 1)/2 – n, which is n(n – 1)/2, or (n2 – n)/2. The number of invoices that should never been printed is proportional to the square of the number of days using the application. By the end of the first month, you’ll have printed 465 pages when you only needed 30. That’s 435 unnecessary pages. But by the end of the first year, you’ll have printed 66,795 pages instead of 365. That’s 66,430 unnecessary pages. It’s 27 unnecessary 2,500-page boxes of paper. And by the end of the fifth year, you’ll have used 668 boxes of paper to print 1,668,508 pages instead of using just one box to print 1,826 pages. The picture below shows how tremendously wasteful this is. When total effort varies as the square of something (like the number of items to process, or the number of days you’ve been using an application), it’s bad, bad news for efficiency. It means that every time your something doubles, your performance (time, materials consumption, etc.) will degrade by a factor of four. Every time your something increases by a factor of ten, your performance will degrade by a factor of a hundred. When your something increases a hundred fold, performance will degrade by a factor of 10,000. Algorithm analysts characterize algorithms that behave this way as O(n2), pronounced “big-oh of n-squared.” O(n2) performance is no way to live. The good news is that you can usually break yourself out of a O(n2) regime. Sometimes, as Debra’s story illustrates, the solution isn’t even technical: she solved her client’s problem by using an option designed into the end-user interface. No matter where the problem is—whether it’s problem with use, setup, implementation, design, or concept—it’s worth significant time and effort to find the O(n2) problems in your system and eliminate them. Whenever you need reassurance of that idea, just glance again at the image of the paper boxes shown here. And by the way, do you remember my post about “Just go look at it?” Tally one for Debra, for the win. Over the past few weeks, in my advanced database system implementation class I teach at Yale, I’ve been covering the CAP theorem, its implications, and various scalable NoSQL systems that would appear to be influenced in their design by the constraints of CAP. Over the course of my coverage of this topic, I am convinced that CAP falls far short of giving a complete picture of the engineering tradeoffs behind building scalable, distributed systems. CAP is generally described as the following: when you build a distributed system, of three desirable properties you want in your system: consistency, availability, and tolerance of network partitions, you can only choose two. Already there is a problem, since this implies that there are three types of distributed systems one can build: CA (consistent and available, but not tolerant of partitions), CP (consistent and tolerant of network partitions, but not available), and AP (available and tolerant of network partitions, but not consistent). The definition of CP looks a little strange — “consistent and tolerant of network partitions, but not available” — the way that this is written makes it look like such as system is never available — a clearly useless system. Of course, this is not really the case; rather, availability is only sacrificed when there is a network partition. In practice, this means that the roles of the A and C in CAP are asymmetric. Systems that sacrifice consistency (AP systems) tend to do so all the time, not just when there is a network partition (the reason for this will become clear by the end of this post). The potential confusion caused by the asymmetry of A and C is my first problem. My second problem is that, as far as I can tell, there is no practical difference between CA systems and CP systems. As noted above, CP systems give up availability only when there is a network partition. CA systems are “not tolerant of network partitions”. But what if there is a network partition? What does “not tolerant” mean? In practice, it means that they lose availability if there is a partition. Hence CP and CA are essentially identical. So in reality, there are only two types of systems: CP/CA and AP. I.e., if there is a partition, does the system give up availability or consistency? Having three letters in CAP and saying you can pick any two does nothing but confuse this point. But my main problem with CAP is that it focuses everyone on a consistency/availability tradeoff, resulting in a perception that the reason why NoSQL systems give up consistency is to get availability. But this is far from the case. A good example of this is Yahoo’s little known NoSQL system called PNUTS (in the academic community) or Sherpa (to everyone else). (Note, readers from the academic community might wonder why I’m calling PNUTS “little known”. It turns out, however, that outside the academic community, PNUTS/Sherpa is almost never mentioned in the NoSQL discussion — in fact, as of April 2010, it’s not even categorized in the list of 35+ NoSQL systems at the nosql-database.org Website). If you examine PNUTS through the lens of CAP, it would seem that the designers have no idea what they are doing (I assure you this is not the case). Rather than giving up just one of consistency or availability, the system gives up both! It relaxes consistency by only guaranteeing “timeline consistency” where replicas may not be consistent with each other but updates are guaranteed to be applied in the same order at all replicas. However, they also give up availability — if the master replica for a particular data item is unreachable, that item becomes unavailable for updates (note, there are other configurations of the system with availability guarantees similar to Dynamo/Cassandra, I’m focusing in this post on the default system described in the original PNUTS paper). Why would anyone want to give up both consistency and availability? CAP says you only have to give up just one! The reason is that CAP is missing a very important letter: L. PNUTS gives up consistency not for the goal of improving availability. Instead, it is to lower latency. Keeping replicas consistent over a wide area network requires at least one message to be sent over the WAN in the critical path to perform the write (some think that 2PC is necessary, but my student Alex Thomson has some research showing that this is not the case — more on this in a future post). Unfortunately, a message over a WAN significantly increases the latency of a transaction (on the order of hundreds of milliseconds), a cost too large for many Web applications that businesses like Amazon and Yahoo need to implement. Consequently, in order to reduce latency, replication must be performed asynchronously. This reduces consistency (by definition). In Yahoo’s case, their method of reducing consistency (timeline consistency) enables an application developer to rely on some guarantees when reasoning about how this consistency is reduced. But consistency is nonetheless reduced. In thinking about CAP the past few weeks, I feel that it has become overrated as a tool for explaining the design of modern scalable, distributed systems. Not only is the asymmetry of the contributions of C, A, and P confusing, but the lack of latency considerations in CAP significantly reduces its utility. To me, CAP should really be PACELC — if there is a partition (P) how does the system tradeoff between availability and consistency (A and C); else (E) when the system is running as normal in the absence of partitions, how does the system tradeoff between latency (L) and consistency (C)? Systems that tend to give up consistency for availability when there is a partition also tend to give up consistency for latency when there is no partition. 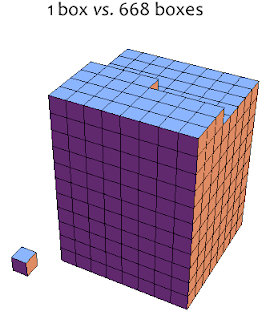 This is the source of the asymmetry of the C and A in CAP. However, this confusion is not present in PACELC. For example, Amazon’s Dynamo (and related systems like Cassandra and SimpleDB) are PA/EL in PACELC — upon a partition, they give up consistency for availability; and under normal operation they give up consistency for lower latency. Giving up C in both parts of PACELC makes the design simpler — once the application is configured to be able to handle inconsistencies, it makes sense to give up consistency for both availability and lower latency. Fully ACID systems are PC/EC in PACELC. They refuse to give up consistency, and will pay the availability and latency costs to achieve it. However, there are some interesting counterexamples where the C’s of PACELC are not correlated. One such example is PNUTS, which is PC/EL in PACELC. In normal operation they give up consistency for latency; however, upon a partition they don’t give up any additional consistency (rather they give up availability). In conclusion, rewriting CAP as PACELC removes some confusing asymmetry in CAP, and, in my opinion, comes closer to explaining the design of NoSQL systems. Today the new OakTable web site, www.oaktable.net, has been published: many thanks to Kurt Van Meerbeeck (that I’m told worked the most on the site), James Morle and Marco Gralike!